Suspect Laurence Key, a devout Democrat who hates Republican war heroes. A Floridian suspect was arrested by federal law enforcement after he allegedly threatened to kill war hero and U.S. 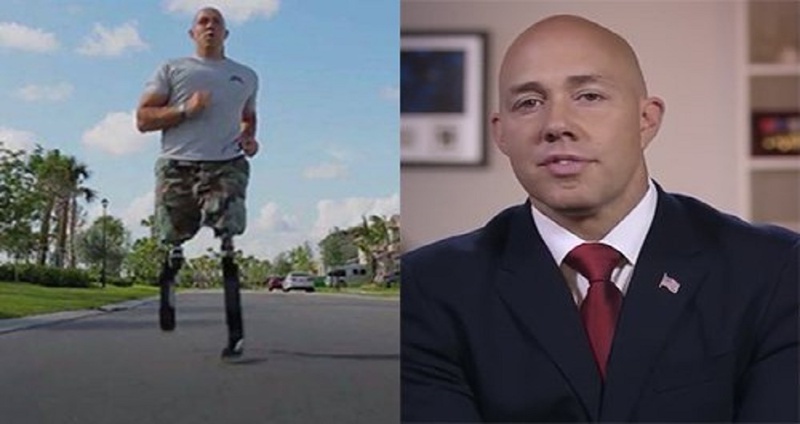 Congressman Rep. Brian Mast (R-FL). The same suspect also threatened to kill the lawmaker’s three minor children, the oldest child who is only 8-years-old. In addition, Key made numerous death threats against the Wounded Warrior Congressman and his children. Documents filed in Florida’s US District Court reveal that Key placed close to 500 telephone calls just to Mast’s office. According to the Federal Complaint that was filed, while being questioned by an FBI investigator, Key said, “Mast should be separated from his kids” for supporting Trump’s immigration policy. The federal complaint also describes how on Monday, Key telephoned other lawmakers, Florida Senators Marco Rubio, a Republican, and Bill Nelson, a moderate Democrat. In Key’s Facebook and Twitter accounts he is listed as registered Democrat who is very politically active in Florida. 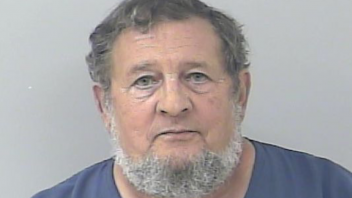 He is a worker for the local office of the Democratic Party of Martin County and he is a volunteer with Planned Parenthood. “The interesting thing about Key’s background is that he works for a group that kills unborn children and he is threatening to kill three children because they are the offspring of a conservative politician. While his military career was cut short, Mast worked for the Homeland Security Department and other law enforcement agencies. Sadly, this wasn’t the first time a Democrat has used the threat of violence or violence to lash out against Republican politicians or supporters. One year ago, James Hodgkinson, a left-wing activist who worked as a Bernie Sanders volunteer brought a gun to an inside the Beltway baseball field while Republicans were practicing for the annual Congressional Baseball Game. Hodgkinson shot Congressman Steve Scalise, who was seriously wounded in front of dozens of eyewitnesses. On Wednesday, actor and brother of “Hanoi” Jane Fonda, Peter Fonda tweeted that he’d like to see Donald Trump’s son Barron taken away from the First Lady and thrown in a cage with pedophiles. In addition, U.S. Rep. Maxine Waters told her supporters to be aggressive towards anyone who works in the Trump administration. Key has been charged with communication of a threat to kidnap or injure a person. Congressman Mast has one daughter and two sons, all of who are under 10 years old. According to his Wikipedia page: After graduating from South Christian High School in 1999, Mast enlisted in the United States Army Reserve in May 2000 and went to become a combat engineer. 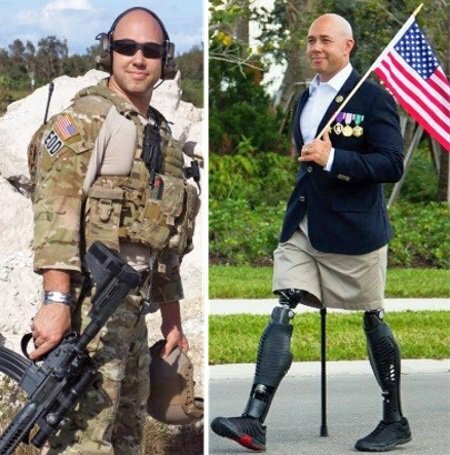 In 2006, he transitioned to the active U.S. Army and became an explosive ordnance disposal technician. Mast later joined the 28th Ordnance Company. He served in Afghanistan as part of Operation Enduring Freedom. On September 19, 2010, while clearing a path for United States Army Rangers in Kandahar, Mast took a wrong step into an IED along the road. The explosion resulted in the amputation of both his legs and one of his fingers. After being honorably discharged from the U.S. Army, Mast was hired as an explosives specialist for the United States Department of Homeland Security. While recovering from his injuries at Walter Reed Army Medical Center, Mast provided explosive and counter-terrorism expertise to the Office of Emergency Operations at the National Nuclear Security Administration from July 2011 to February 2012 and as an instructor of Home Made Explosives for the Bureau of Alcohol, Tobacco, Firearms and Explosives. Unfortunately, it is going to get worse…. A lot of this can be laid on the Democrats on the hill, who use their voices and appointed seats to spew Hate! It is time for change, some of these people need to go. Personally I think they should be prosecuted but then that’s just me I guess. I think Maxine Waters, as a Congresswoman, should most definitely be impeached. What she is doing is inciting people to riot by harassing others who are Conservatives, Republicans, those that support President Donad Trump or work in his administration. She said she is not telling anyone to commit violence, but have you seen these type of actions NOT lead to violence. She is committing tyranny and basically asking for a revolution.